Applied Management Science 2 Edition Emphasizes building the most appropriate model possible from the available data. * Major focus is on analysis and communication of results to management. 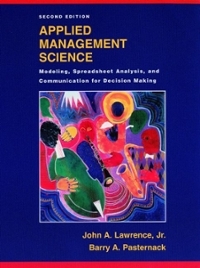 Teaches readers how to conduct a management science study, analyze different situations, break down the steps of problem-solving, write a business report, and effectively communicate study results to management. * A supporting CD-ROM is packaged with every book to include three complete additional chapters, additional cases and problems for every chapter, coverage of key algorithms and derivations, a review of statistics, the complete WINQSB package developed by Yih-Long Chang, and Excel files for every chapter. * Computer Integrated Approach: Use of Excel, WinQSB, and LINDO for windows integrated throughout text for use in solving models.